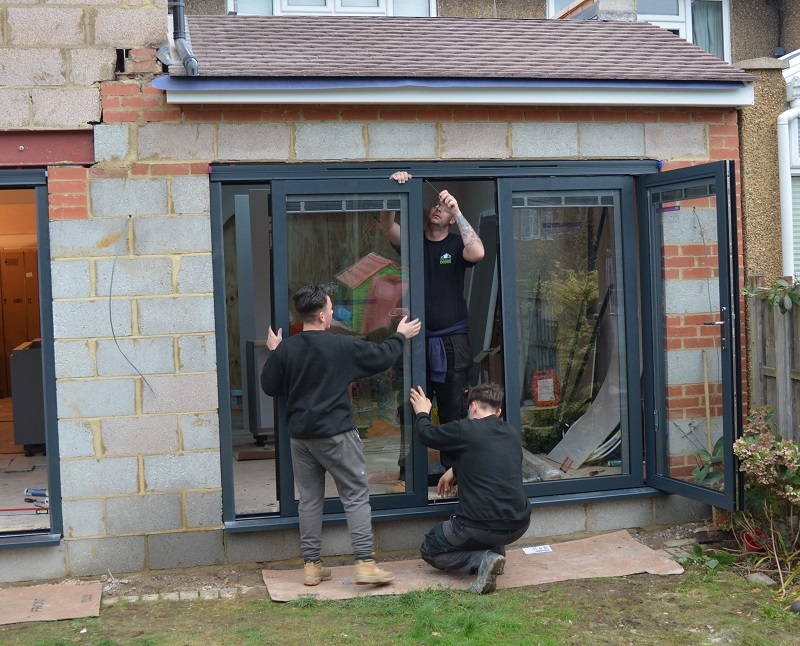 It was a case of its good bi fold hello Panoramic, as Professional Builder watches the installation of a totally new concept in patio doors. After more than three months with only a few well-worn sheets of plywood between them and the early spring chill, the moment had finally arrived when the Stapleton family could come in from the cold. Much time and effort had previously been spent deliberating over the choice of patio door to link a fabulous new kitchen and dining area to a soon-to-be landscaped rear garden. A quick glance to either side of the property reveals similar projects undertaken by their neighbours in this affluent suburb of Watford, with an impressive array of new bi-folds on show. All very neat and tidy of course, but this is clearly a family who like to stand out from the crowd as their eventual selection of door proves. 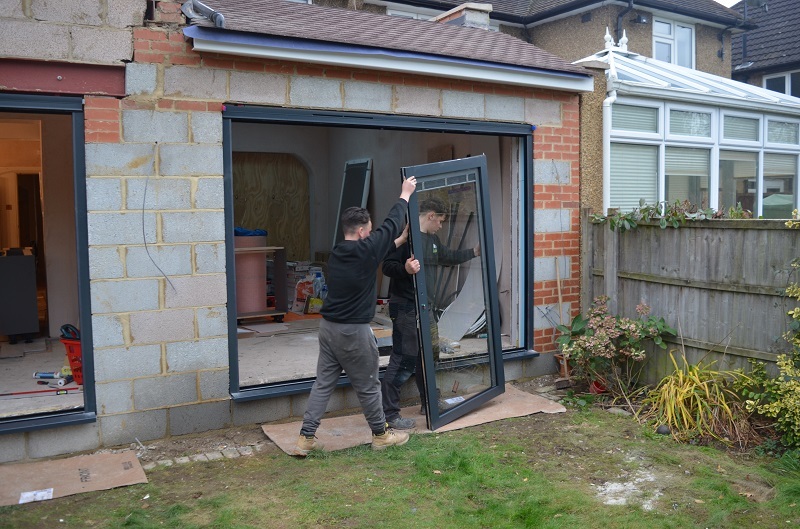 Owner Adrian told us: “As a very significant part of the overall renovation budget I spent a good deal of time researching the patio door market and the standard bi-fold initially appeared to be the obvious answer. 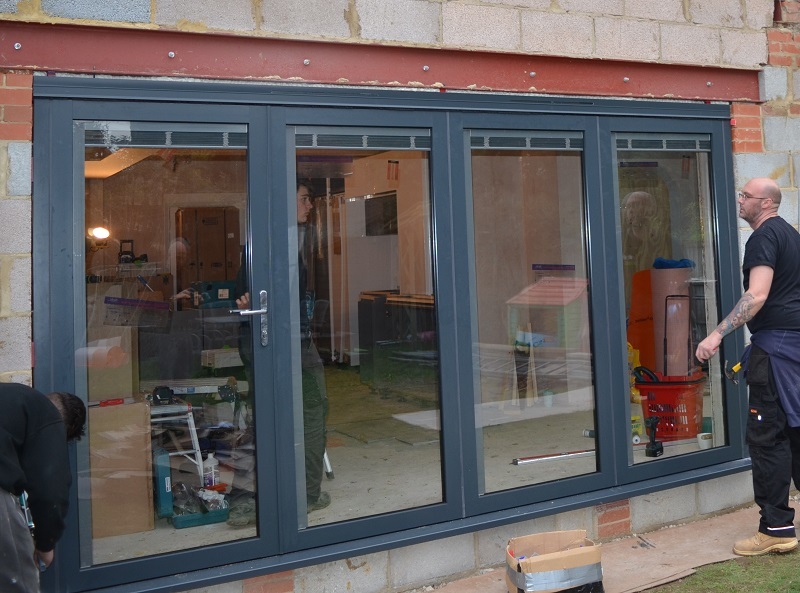 “However, on a recent visit to one of the Probuilder Live shows with my builder I was attracted to a new type of aluminium folding door which offers really clean lines and a configuration of openings, which seemed ideally suited to hectic everyday life family with kids and animals constantly in and out. Based in Sheffield, Panoramic Doors have pioneered the hingeless operation concept. Each panel moves independently of each other, allowing more freedom, easier operation and control of the openings. Large patio doors are notoriously heavy and are traditionally top hung, meaning the weight is borne by the header, which often has to be specially engineered. With the Panoramic door however, the weight of the panels is supported by the bottom track doing away with special headers. The swing door panels come with a deadbolt and two or more hooks that lock into the neighbouring panel to ensure smooth transfer and security as the panels cannot be lifted out of the track. The whole process begins with the company arranging a site visit to accurately survey the opening with the doors then factory made to size. A number of panel options are offered from two to six and can be fitted with Integral blinds which are operated by a clever magnetic slider arrangement or a remote control. Three standard colours are offered and the U Value is now 1.6 as standard, comfortably meeting all Building Regulations. Not only that, but the new CGI Installation Guide is now on the homepage of the website. 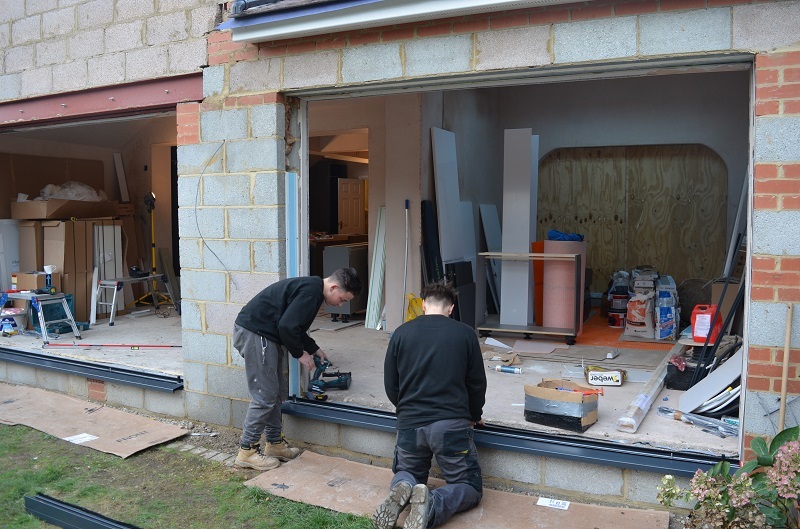 The three-man team for this particular installation, from Vison Doors, had been up since the crack of dawn from their Sevenoaks base, confident in the knowledge that their biggest obstacle to completing the task on time was the notorious journey round the M25. The key, of course, is in the preparation with all the frame components pre-drilled and cut to the exact heights and widths. In the 12 months they have been involved with Panoramic, they have been averaging an installation a day although the record was six individual doors in one rather long day during the summer. It was quickly apparent that each member of the team had a distinct role in the installation and by the first tea break of the day one three panel door was in situ. The larger six door panel soon followed and then it was a case of fine tuning the inner workings to achieve the smoothest possible opening and closing options. A videoed customer run through to ensure everyone was totally happy with the end result saw the team happily on their way back to deepest Kent by early afternoon. “This feels like a massive step forward towards the completion of the project, and I am delighted with the look and feel of the doors,” confirmed Adrian as envious faces started to appear over the neighbouring fences.